It has been a week full of wonderful memories as well as a sense of anticipation for the upcoming event on Saturday. We are so excited to share our heart and our time with the hundreds of people that are coming. If you haven’t got your tickets, it’s not too late! Go to RachelDye.com to purchase, or alternatively there will be a limited number of meal tickets sold at the door…and if we run out you are still welcome, just maybe a little hungrier. Don’t let procrastination be the reason we don’t get to see you! As we continue in our “status quo” of treatment, I would like to work backwards through our week to share some highlights. Tonight, we dressed up as a family and visited the grandparents, a cousin’s house, and then a harvest party at a local church. To answer your question, yes, I’m a taco and yes, Rachel’s a llama. 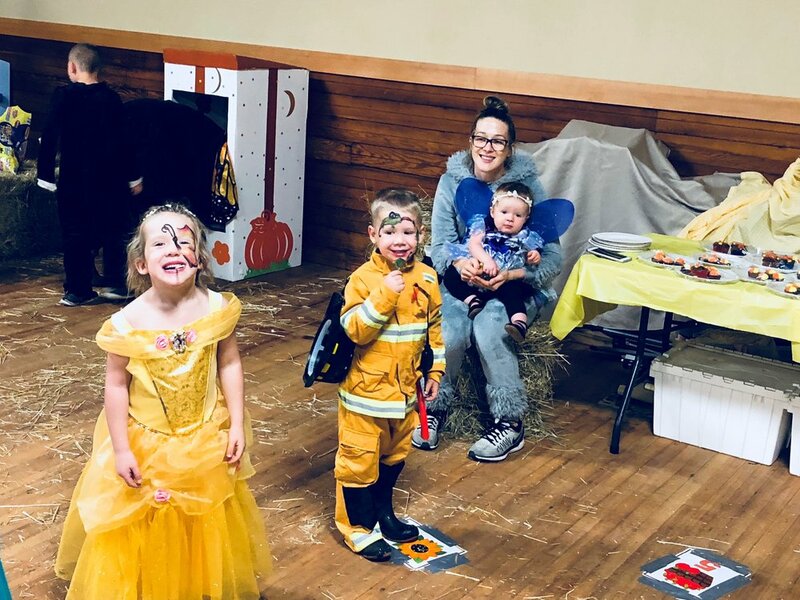 The kids went more traditional with a firefighter, princess, and fairy. 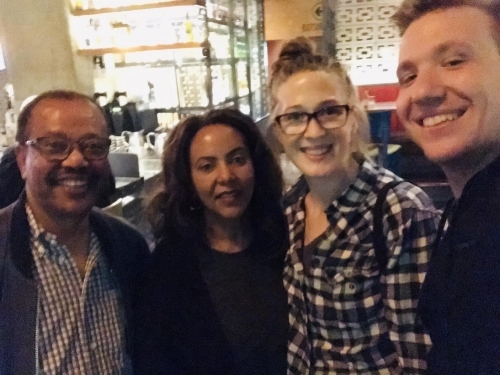 Last night in Seattle, we met up with Rachel’s uncle Wasi and his wife Seble. Wasi was an exchange student for a year with the Donald family back when Jim was as loud as Dan (or so I’ve heard). The next year, Grandpa Donald helped Wasi and many of his family members migrate from Ethiopia during a time of political unrest and Wasi and his family have been Donald’s ever since. We talked with Wasi at Uncle Steve’s graveside service and decided to meet up during one of Rachel’s treatment trips to Seattle. We sat together last night and caught up on our recent story, what they’ve been up to, and (most enjoyably for me) Rachel and Wasi reminisced about their white horse Reggie, Indian Bread, and how much Seble hates camping. It was a really wonderful time growing in relationship with two great people. Rachel and I find ourselves striving for connection with people more and more through this trial. There are few things more important to us at this point than to connect with those we love and who love us. Last week, we got a text from a friend that said “Do you want to go to a John Crist show on Friday”? 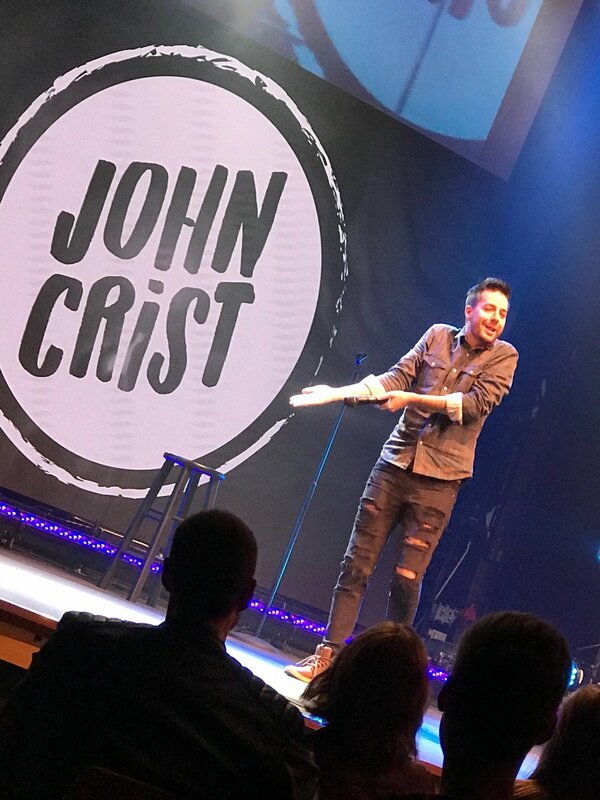 For those of you that don’t know, John Crist is a viral Christian comedian who has risen to fame in recent years mostly due to his video skits that poke fun at many of the things that growing up Christian made us go “huh” (Father Abraham, etc.) Anyways, John’s show has been sold out for four months and so when this friend asked, we said yes! Turns out, they had messaged John directly, told him about our story, and he actually responded. 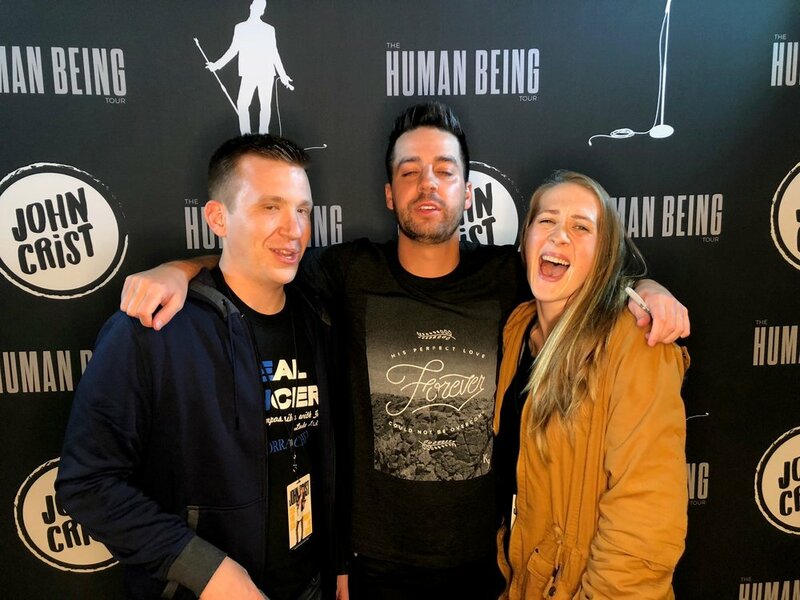 Next thing we knew, John was working with his sister/manager Emma to get us VIP tickets to the show and passes to the meet and greet beforehand. We had such a great time meeting John, taking some pictures, and laughing ‘til our faces hurt. It was the perfect break from life for a couple hours. Finally, I had reached out a couple months ago to American Eagle with Rachel’s story. Rachel has always loved American Eagle jeans, and on a whim I thought I’d message them, asking them to sponsor Rachel’s fight against cancer like many companies may sponsor a sports star. 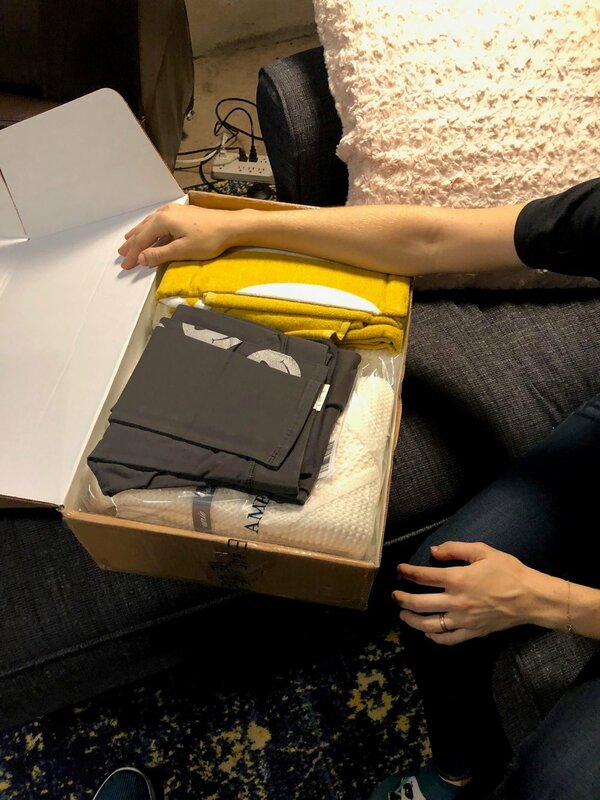 Last week we got a box full of blankets, towels, and leggings to help Rachel through this journey. Now, I know nothing about this company. I don’t know what they promote or where they invest. I don’t know their ideology or morals. What I do know is that there are at least two people at American Eagle that showed kindness to my wife and I am grateful to them. My point with these four stories is this: It’s the little things in life that matter. None of these four things tangibly advanced our fight against the cancer that is in Rachel’s body. They didn’t change our circumstances or our outlook for the coming years. But that doesn’t mean that they weren’t important. I am a planner and I often try to think about life in terms of efficiency. How efficiently can I get this thing done, how can I eliminate steps to get to where I want to go as quickly as possible. I’m learning that this way of thinking can get in the way when you realize your life is fundamentally out of your control. I often get stuck…thinking if we just took one more supplement, if Rachel ate just one more salad, or I worked one more hour we would be better off. Turns out, that’s not how it works. God doesn’t promise to change the circumstances of our trials. What He does promise is to see us through them. I think He does that through the little things. The dinners with old family friends, the kindness of strangers, stupid jokes that make us laugh, and someone caring enough to send Rachel something to make her a little more comfortable. James 1:2-3 - Count it all joy, my brothers, when you meet trials of various kinds, for you know that the testing of your faith produces steadfastness. And let steadfastness have its full effect, that you may be perfect and complete, lacking in nothing.